By Kellie Koester It has taken me several weeks to sit down and put my feelings into words. A few months ago I wrote about the experience of organizing a women’s team to play in a mixed-gender ultimate frisbee league. The season has now ended, and it has taken some time to process the experience that our team built. From the beginning my co-captains and I set the tone of the team as a place of growth, mutual respect, and experimentation. We stressed that every player should feel comfortable giving and receiving feedback from every other player. Initially, our teammates voiced concerns about being able to compete against co-ed teams, and about possible injuries resulting from matching up against male players who might be significantly larger than us. So we discussed playing with confidence and without fear. We discovered that the gender of our match-ups didn’t give us a disadvantage so long as we worked together as a team, and played with the mentality of “that’s my disc.” Our teammates took all of those principles to heart, and brought their own goals for themselves and for the team to every game. "Most of that feedback was positive, but we did encounter some teams that struggled with playing against a team of all women." Despite the fact that our Seattle winter league does not keep score, many people asked if we'd won or lost, or what the final scores were. I have no numbers to share, but I can confidently say that we “won” some games, “lost” some games, and had many games that were close. One of our team captains spoke with the opposing team at every game. We did not have a formal survey, and the trends listed below are simply our own observations. We asked teams to describe their experiences, if they felt they had to change their style of play in response to our team, and how they felt their own team handled gender equity. Most of that feedback was positive, but we did encounter some teams that struggled with playing against a team of all women. Some teams discussed their concerns together, and a few teams did not recognize their own biases. The first trend we observed from other teams’ feedback was , “It’s fine because you’re good players,” or, “It’s OK because we know you.” At first, I gave these comments little thought. They were compliments, even. The third or fourth time hearing them, however, I began questioning the implications. Sometimes you play teams that you know. Sometimes you play teams that you don’t know. Sometimes those teams are equal to or above your own team’s skill level. Sometimes those teams are below your own team’s skill level. Would it not have been okay, then, to play against an all women team they didn’t know? If we were a group of less-skilled women, would our opponents have not wanted to play against us? Is that a reflection of differences in skill level, or gender bias? "Is that a reflection of differences in skill level, or gender bias?" On that note, the second trend that we observed is that higher-level teams had feedback like, “We didn’t change our game in any way,” or, “It was just ultimate.” Lower level teams that we played noticed differences in playing against us. One team told us that when changing to defense on a fast break, their men had to shift their perspective from, “Guard the closest man,” to, “Guard the closest person.” One player said that he felt he had to be more careful with his body, and be more aware of where people were on the field. While I appreciate his focus on not injuring anyone on the field, at a recreational level of a non-contact sport, shouldn’t that be the norm? The third trend was a discussion of sportsmanship and what it means. One team, after scoring a point where one of their tall, male receivers caught the disc, started to discuss among themselves about altering their play style. One of the women on their team emphatically told them no, that they shouldn’t assume that they would win all of those match ups in the end zone, and that playing down to a team was condescending. Another team had a discussion about gendered language in a mixed game. In ultimate we play both zone defenses and “man” defenses. When calling out defensive lines, they felt uncomfortable saying “man” defense, and decided to use the term “person” defense instead. As for our own team, we established early that as a team we wanted people to fill new roles, and to take risks. We spoke about trying new things on the field first, and worrying about the outcomes of those risks second. We had pragmatic conversations about our offenses and defenses, taking into account our relative lack of height. When we played person defense, we forced male players towards the disc, and female players to the end zone to set up match-ups that we wanted. On offense we punished poaches and stayed collected and calm. Most of the team did not engage in conversations surrounding gender with the opposing team. During game play, it felt like a normal game of ultimate. We thought about match-ups and about zones, and about how to gel on offense. Our gender and the gender of our opponents did not create conflict for us. It was a strategic puzzle to solve. Without a doubt, the team will be back together for next year’s winter league. The experience of playing with talented women from different and often separate sects of the larger women’s ultimate community benefited us all. I believe that we started important conversations among mixed teams in our community regarding women’s roles in our co-ed sport. Our own teammates benefited from a safe space to try new skills, ideas, and strategies. 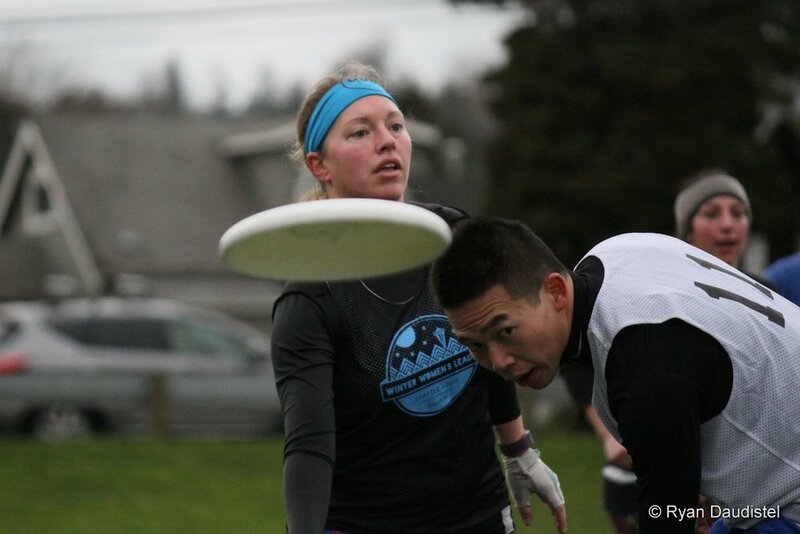 New connections were made within the Seattle women’s ultimate community. There are too many beautiful moments and memories to share.